2018 Hyundai Santro has been officially unveiled on October 9. Here’s everything that we have got from its media preview. Just as the launch date of the Hyundai hatchback is coming closer, the buzz is getting stronger. Let’s quickly go through official dimensions, variants, features, price, photos, and mileage details – what we are going to see in the actual car. It was first launched in 1997 and challenged the mighty rivals – Maruti 800 and Tata Indica, of that time period. Eventually, it went on to capture a large portion of its segment. Now, the all-new 2018 Santro, codenamed AH2, will be revealed tomorrow. After getting launched on October 23, it will compete with Tata Tiago and Maruti Suzuki Celerio. The hatchback from the South Korean manufacturer is going to be wider than Renault Kwid and Maruti Celerio but will possess the same height. The wheelbase is similar to Tata Tiago but shorter than Kwid and Celerio. Also, Santro is bigger than current WagonR and will be available with 14-inch steel wheels. It is 45mm longer than old Santro. The sources have told us the new Santro will come with an ARAI-rate fuel efficiency of 20.3 kmpl. It’s a good mileage for a hatchback but lower than what WagonR and Kwid offer. It will pass off as it’s going to be a more premium offering than its competitors. Both the MT and AMT variants will have the same mileage. The mileage of new Santro is way ahead of old Santro. It will come in a total of 7 variants. Out of which 5 will have manual transmission. The next-gen Santro will get a 1.1 litre four-cylinder naturally aspirated petrol engine which produces 68bhp of power and 99Nm of torque. 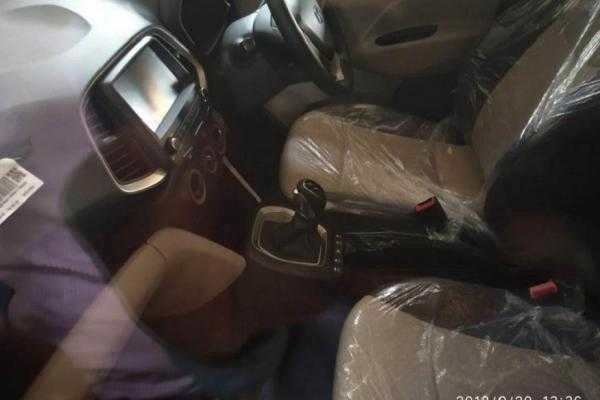 It is the same engine as of the old Hyundai i10 and will come with a 5-speed manual transmission as standard. There will be an automatic variant too. It is made safer and stiffer with several reinforcements. Thus, the new model of Santro will be at par with its immediate rivals like Kwid and WagronR, and strong as Celerio. The 2018 Santro will be the first car from Hyundai to get an AMT and will be marketed as the Smart Drive. It will become a direct rival of AMT models of WagonR, Celerio, Kwid, and Tiago. The car will get an optional company-fitted CNG kit which will be better for those who are looking for really low running costs. There will be no diesel variant. The new engine will be ready with Bharat Stage 6 (BS6) emission norms and Bharat New Vehicle Safety Assessment Program (BNVSAP) compliant. Hyundai makes its cars ahead of its competition when it comes to features and creature comforts. So, we can expect the company to bring us a lot of features onboard in its top-spec variant. It includes the following features. The new-generation variant of Santro will come with a host of features fulfilling the latest safety norms. With an updated platform, it is expected that the new Santro 2018 would become one of the safest cars in its segment with the following features. The primary competitor will be the Maruti WagonR. Other rivals include Tata Tiago, Ford Figo, Maruti Celerio, Renault Kwid, and same variants of new Swift. The interior design layout will be a major change this time. We can expect a premium fit and finish of the cabins with the modern design theme. It is going to have an up-market and plusher cabin. The requirements of the buyers of this compact hatchback will be its high ergonomics and full of usable spaces. So, we would get to see a lot of storage space and practical features. Making the inside visual appeal high, Hyundai will provide this small car with a dual-tone color scheme of black and beige. Also, it will get a 7.0-inch touchscreen infotainment system with Apple CarPlay and Android Auto support. There will be rear AC vents and the buttons below the gear level will give a premium finish to the interiors. Another major change in this hatchback will be its exterior design. Besides having compact dimensions, the design will follow Hyundai Fluidic Sculpture 2.0 design language. So, we can expect it to have a sharp yet elegant exterior design. It may borrow some design elements from Grand i10. Overall, it will possess an elegant layout with the decent use of chrome to enhance its premium appeal. The spy images suggest that it will have a sharp silhouette giving it a little sporty feel. On the whole, the company will play it face with respect to the exteriors. Don’t expect a 2019 Hyundai Elantra like dramatic styling. 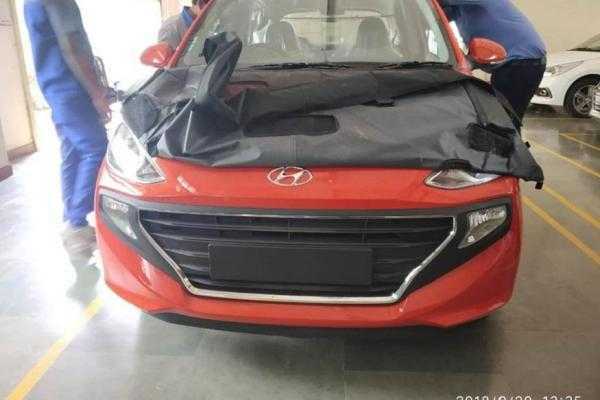 The front side will feature big fog lamps with blacked out casing, and swept back, sharply cut headlamps with the signature grille of Hyundai. The front grille will sport a chrome outline. 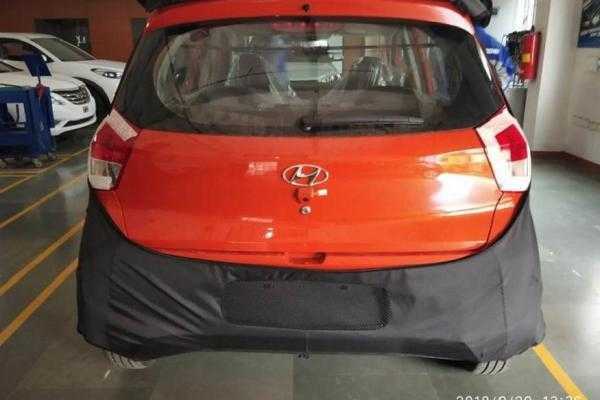 The side design will be similar to the earlier Santro and the tail lamps will be similar to that of Grand i10 and big in size. Overall, it will be crafted to lure the mass-market buyers. It will have a large rear windshield along with a rear wiper. The new Santro will have more space to offer than the previous i10. So, it means that there will be many high-end features in the cabin along with enough space to carry 4-5 adults. However, the boot space will be average at 235 litres. It is less when compared to best-in-segment boot space of 300-litres offered by Kwid. But, it will still be larger than what Maruti Alto K10 offers. Santro will be first launched in India followed by Latin American markets, a month later. It will become the most-affordable car from the company and will be positioned below the Grand i10. So, it will take over the company’s slow-selling Eon. It will replace the i10 hatchback and will find itself between Eon and the Grand i10. So, we can expect its price to fall between Rs. 3.5 lakhs to Rs. 5.5 lakhs. It should be noted that the new Santro won’t indulge in the pricing wars with Maruti Alto 800 likes. It’s because it is a bigger car and comes with far more modern, safety, and premium features. It will make it come with a slightly higher price tag than the current budget cars. The car will come with a 1 lakh kms/3 years standard warranty. The bookings open on October 10. The first 50,000 customers can book the car by depositing Rs. 11,100. This is all about 2018 Hyundai Santro for now.